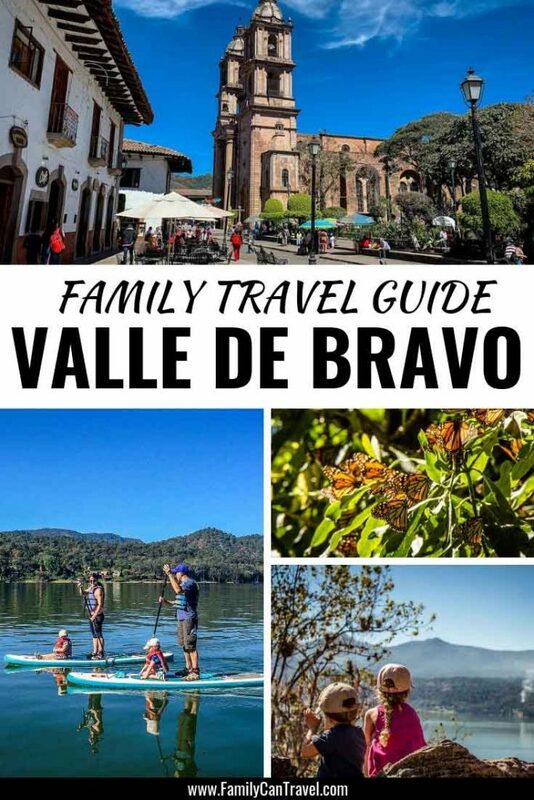 Valle de Bravo is where Mexico City’s upper-class comes to enjoy their weekends, so after 5 days in Mexico City with kids we thought we’d join them! 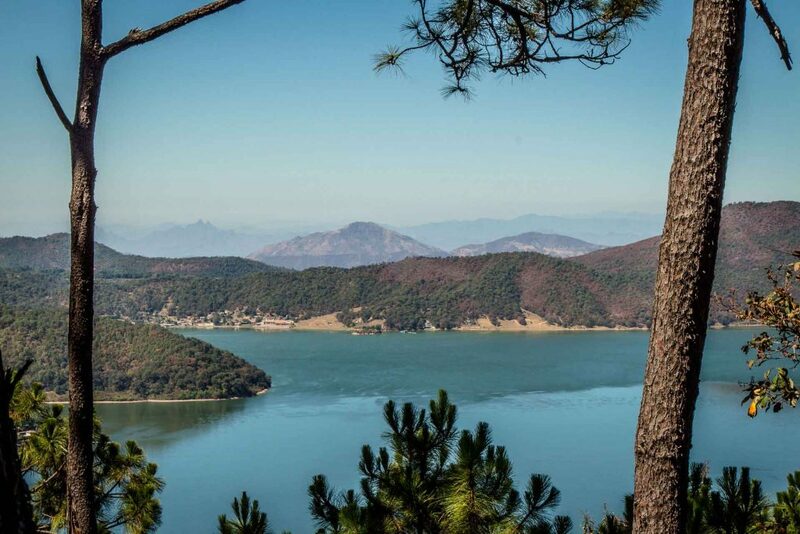 Nestled high in the mountains on the shores of beautiful Lago Avandaro, Valle de Bravo is a wonderful place to visit. 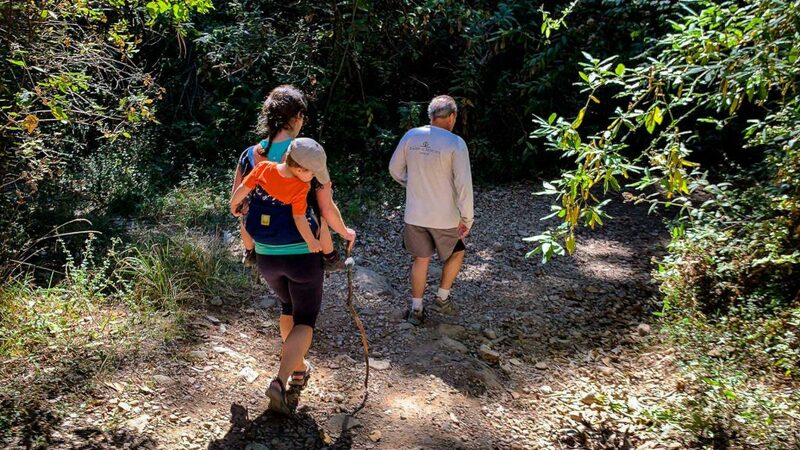 We enjoyed some great hiking, stand-up paddleboarding an even knocked off one of our bucket-list items – viewing the millions of Monarch Butterflies which have migrated from Canada for the winter. It was truly amazing! 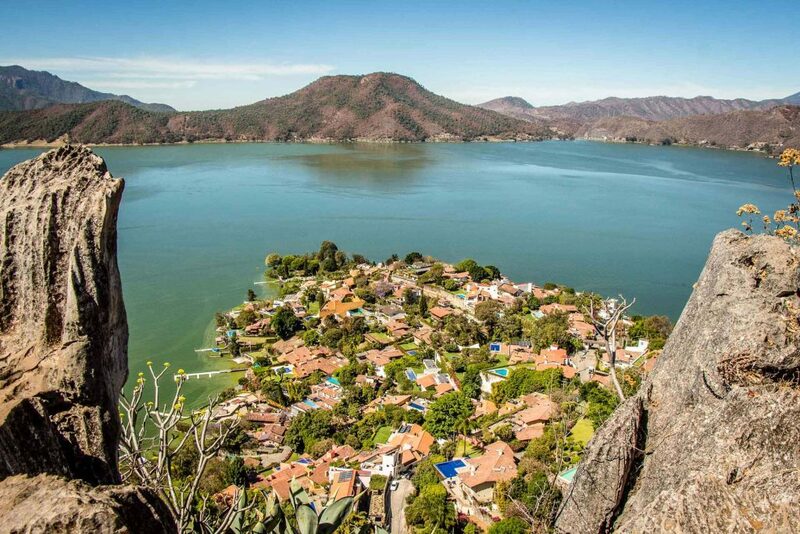 Valle de Bravo is approximately 87 miles (140km) west of Mexico City. 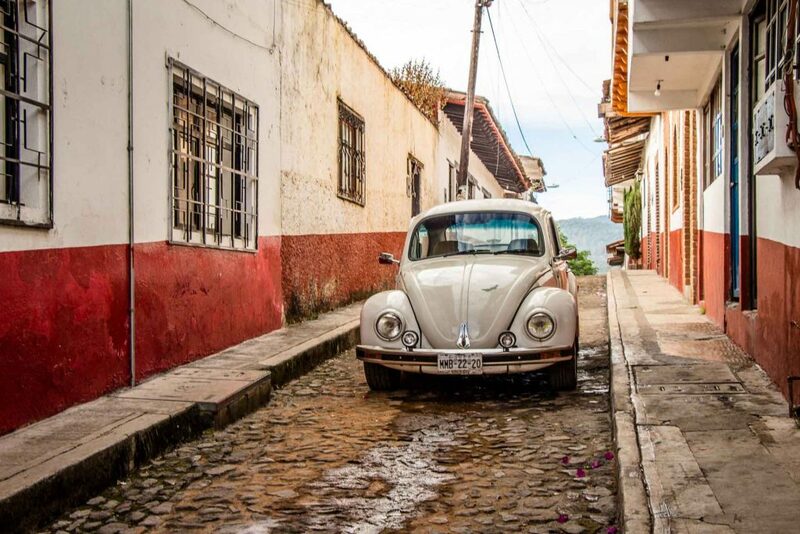 If you don’t have your own car, the easiest way to get to Valle de Bravo is by bus. Take an Uber to the Poniente bus terminal and go the Zina Bus counter. 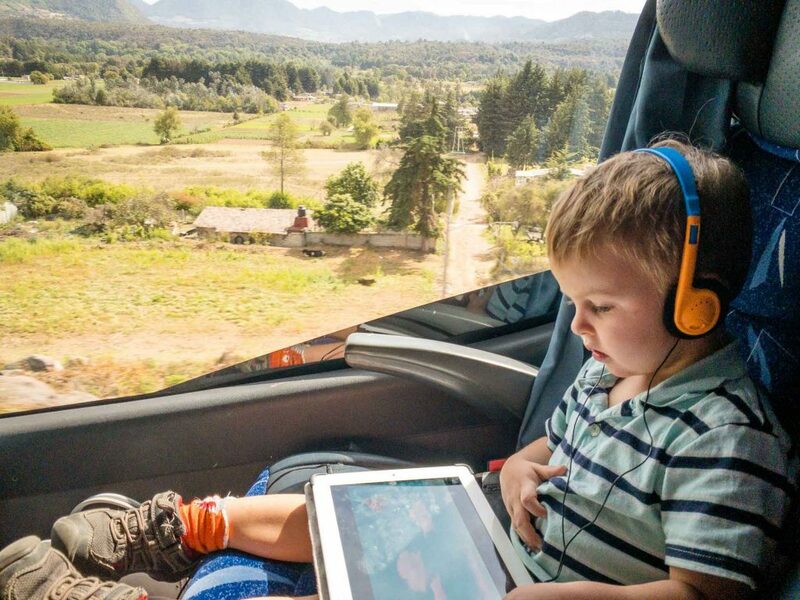 Zina Bus offers several non-stop Valle de Bravo bus trips every day. The buses are quite nice, with air conditioning and tv’s playing movies. We each got a free drink and bag of chips for the journey. The 2 hour bus journey was really nice, taking you through some very affluent parts of CDMX followed by some very pretty tree covered hills. You can supposedly buy tickets from Zina Bus in advance online, but I’ve never been able to get that part of their webpage to work for me. I was still able to make advance reservations via email. 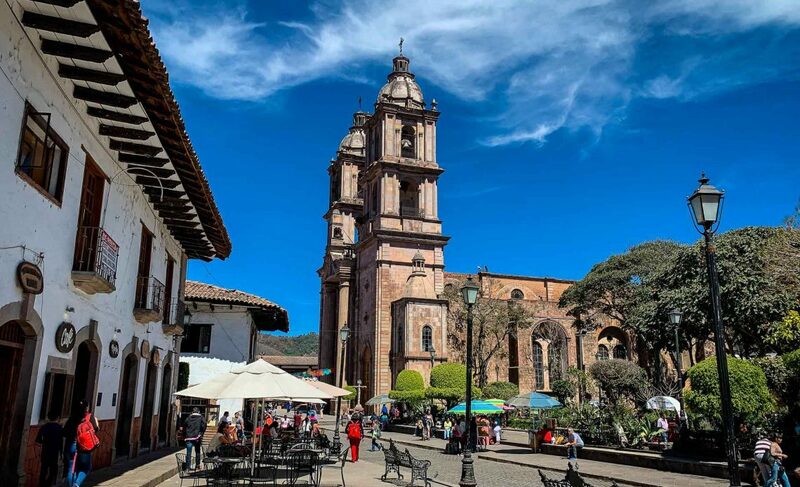 If you prefer to rent a car to Valle de Bravo, but want to avoid driving in Mexico City, consider taking an Uber to the affluent Zedec Santa Fe neighborhood in the far western outskirts of Mexico City, where you will find several international car rental chains. Be sure to read our post on car rental scams in Mexico before you proceed. 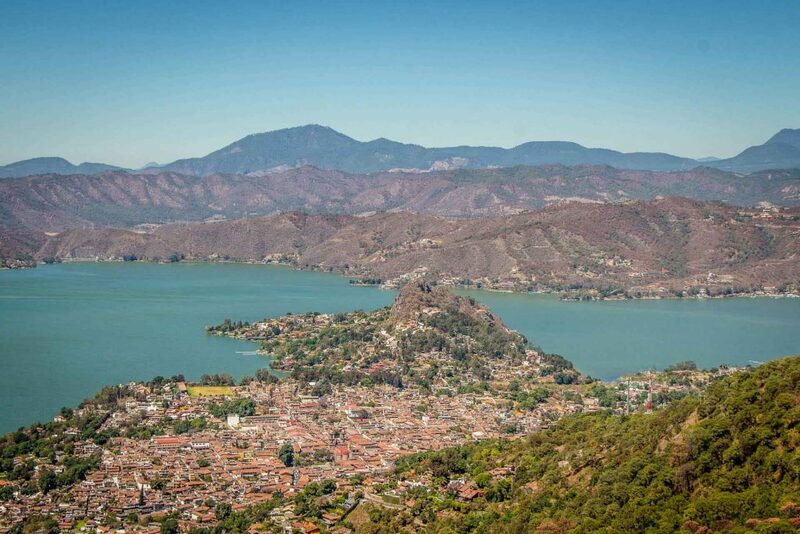 There are two main tourist areas within Valle de Bravo: the lakefront and the historic town center. 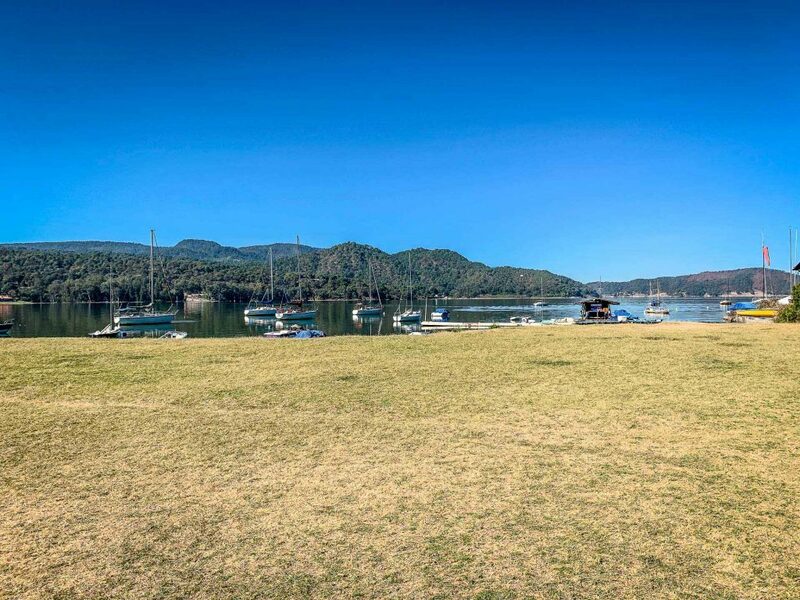 The lakefront plaza at the bottom of Calle de la Cruz offers nice views of the lake and surrounding hills. 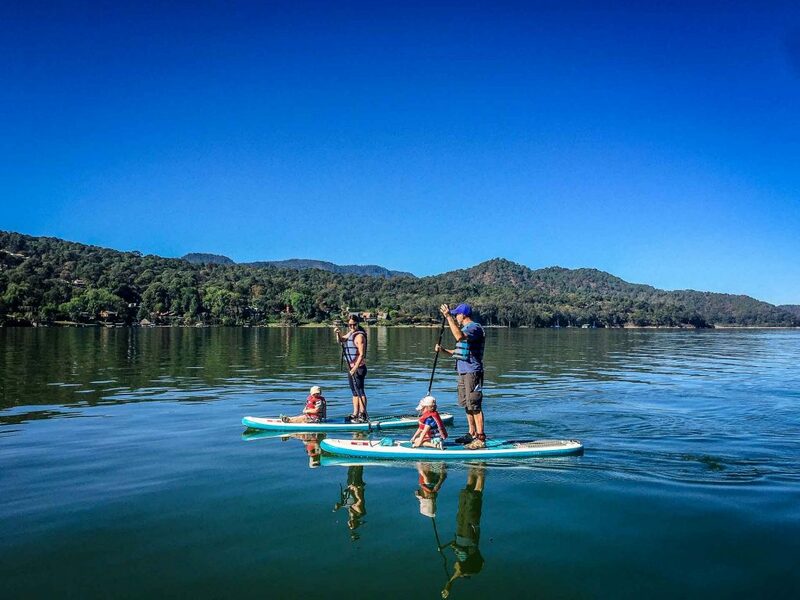 This is the central activity point for all water-based activities in Valle de Bravo; floating restaurants, boat trips, stand-up paddleboarding, kayaks, etc. There are a few market stands with the usual trinkets for sale. You can walk southeast along the waterfront for a while enjoying different views of the lake. 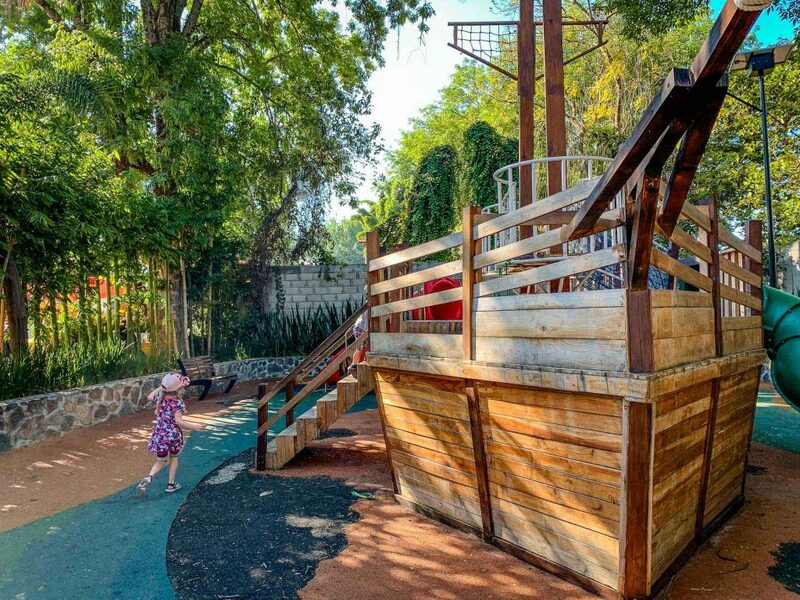 Within a few minutes you will arrive at a really nice pirate ship playground. Our kids didn’t see any playgrounds during our week in Mexico City, so they were very excited. We stopped and let them play for a while and then we had a snack while enjoying excellent lake vistas from the adjacent plaza. 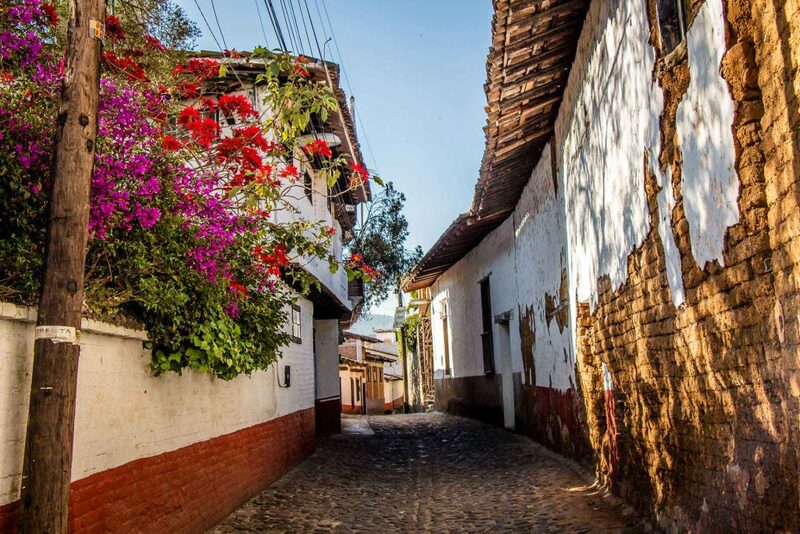 Valle de Bravo has an extremely charming historic center. The blocks surrounding the church (Parroquia de San Francisco de Asís) are pedestrian only, making it very kid-friendly. The nicely treed plaza, which rests in the shadow of the large church, is always buzzing with activity. 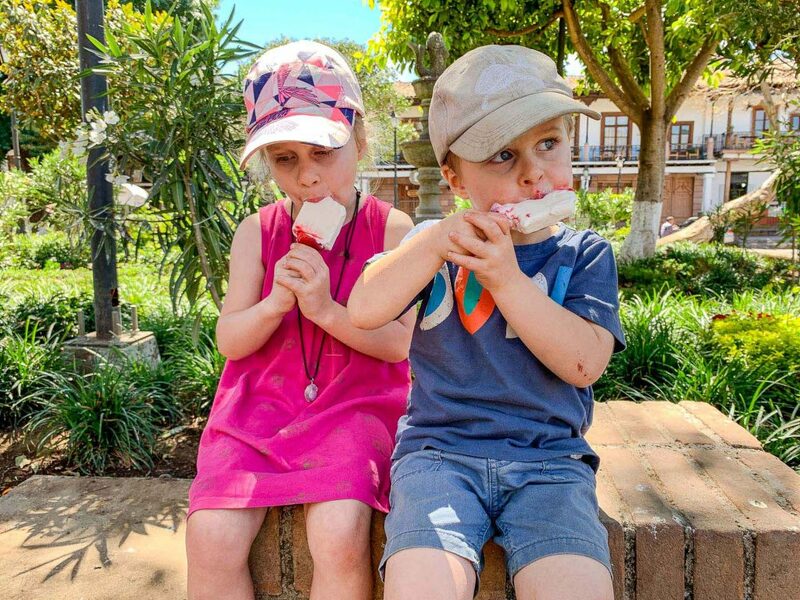 There are restaurants, shops, street vendors, ice cream stands and much more. 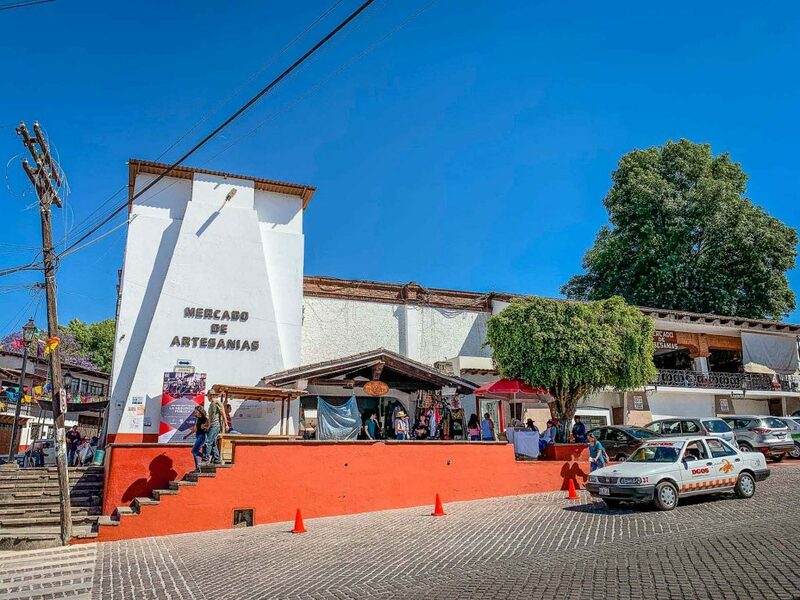 Northwest of the town center is the Valle de Bravo Artisan Market (Mercado de Artesanías). There are two buildings near each other advertising themselves as the Artisan Market, but the real one is in the SE corner; the one on the NW corner was pretty small and uninteresting. The real market is in a two-story square building with shops on both floors. 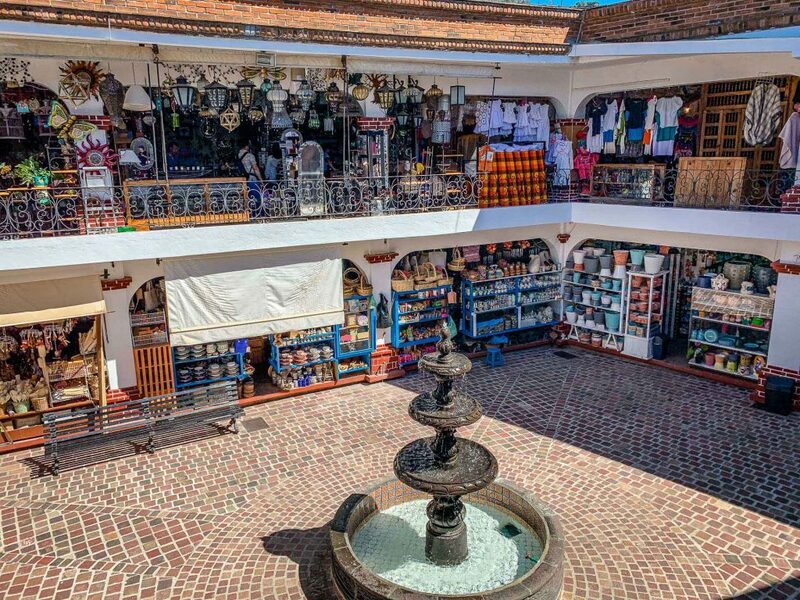 The usual touristy trinkets are found here, but there are also some very nice souvenirs to be found here; quality stuff you’d never find on the street. Today was an awesome day – a bucket list day! 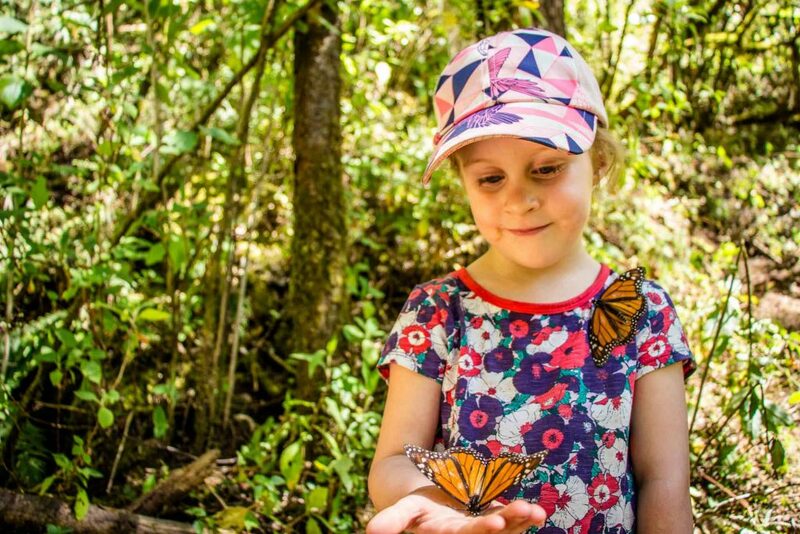 Many years ago Celine and I were watching the amazing BBC nature documentary series Life and saw a segment on the annual monarch butterfly migration from Canada to Mexico. 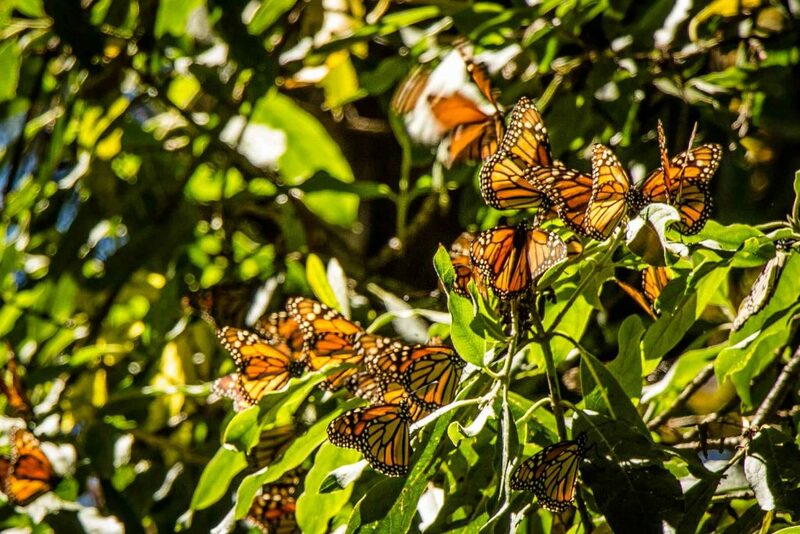 Millions of monarch butterflies congregate within a small area in Mexico, one of which happens to be the Santuario de Piedra Herrada (Piedra Herrada Sanctuary), which is very close to Valle de Bravo. Our first view of the Monarch Butterflies from the taxi! To get to the Piedra Herrada Sanctuary, our Airbnb host arranged an English speaking taxi to take us there and (more importantly) to pick us up again. The monarch butterfly sanctuary is in the middle of nowhere so having a driver we could trust would pick us up was very important to us. Admission into the sanctuary includes a mandatory guide. We started out in a big group, but two people fell way behind and the other group changed their mind and took horses to the top, so soon enough we had our guide all to ourselves. She didn’t speak any English, but she was very helpful with the kids and watched them while we stopped to take pictures. There are a decent number of monarchs at the bottom of the sanctuary, but this was nothing compared to what was to come. 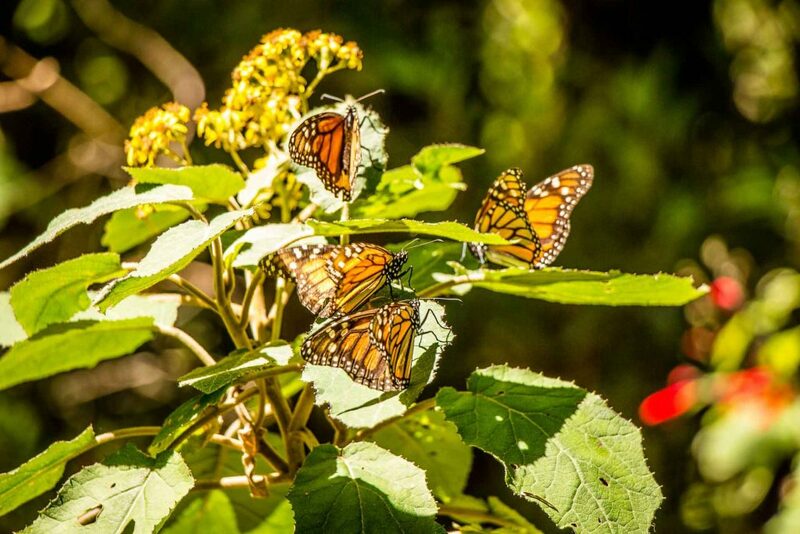 The short uphill walk from the bottom to where the butterflies congregate is about 1.2 miles (2km) long. The Piedra Herrada Sanctuary is 3,000m (9,800 feet) above sea level, which is above the 8,000 ft level where altitude sickness can start to occur. If you are coming from sea level and haven’t had time to acclimatize to the altitude, we’d recommend you take a horse up. 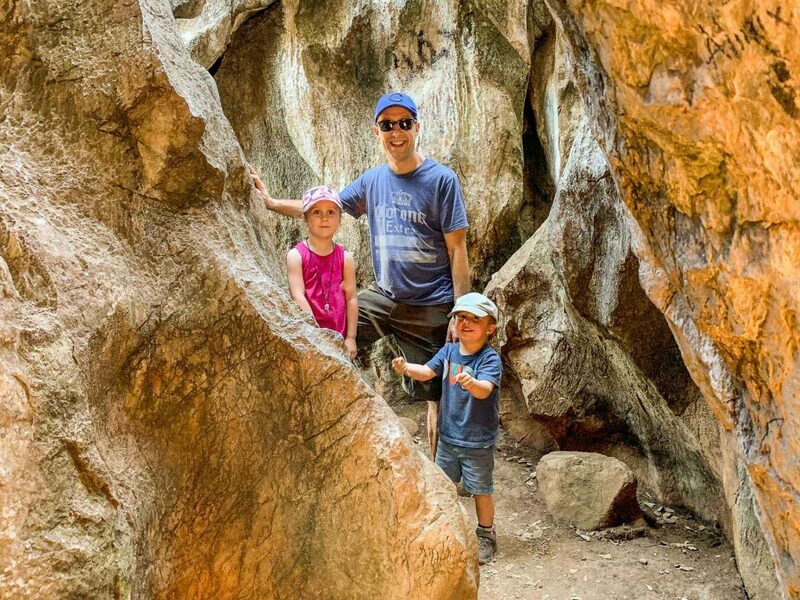 If you have acclimatized, or you are feeling good, it’s a pretty easy hike. Both our kids (age 3 & 5) did it without any help. 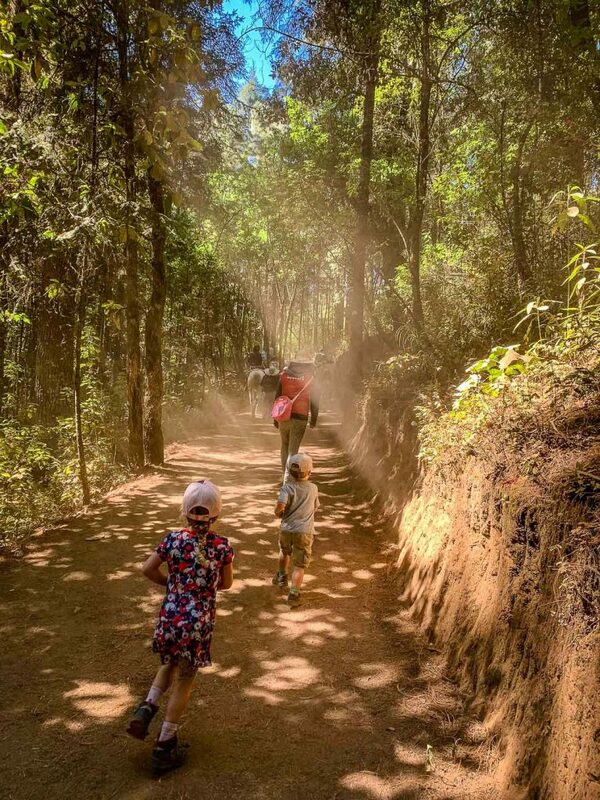 One recommendation though… the trail to the top is extremely dusty and the horses kick up a TON of dust. Regardless of whether you are walking or taking a horse, a dust mask is a good idea. They sell face masks there, but if you’d rather be certain of the quality, these adjustable size Anti-Dust Face Masks have excellent reviews. Also, be sure to wear closed shoes. We wore sports sandals and our feet were incredibly dirty by the time we were done. At the end of the trail we entered a series of smaller, tighter pathways into the trees. It wasn’t long before we started to see a lot of butterflies, then more, then more and more until suddenly they were just everywhere. It’s hard to guess, but there had to be hundreds of thousands of butterflies in the area. Everywhere you look, they are flying. It’s an absolutely incredible sight! We could have stayed there watching mesmerized for a very, very long time, but they have a 15 minute limit for groups to be in the butterfly area. Our guide let us stay around 45 minutes though, which we are grateful for. Interested in learning more about this incredible migration? 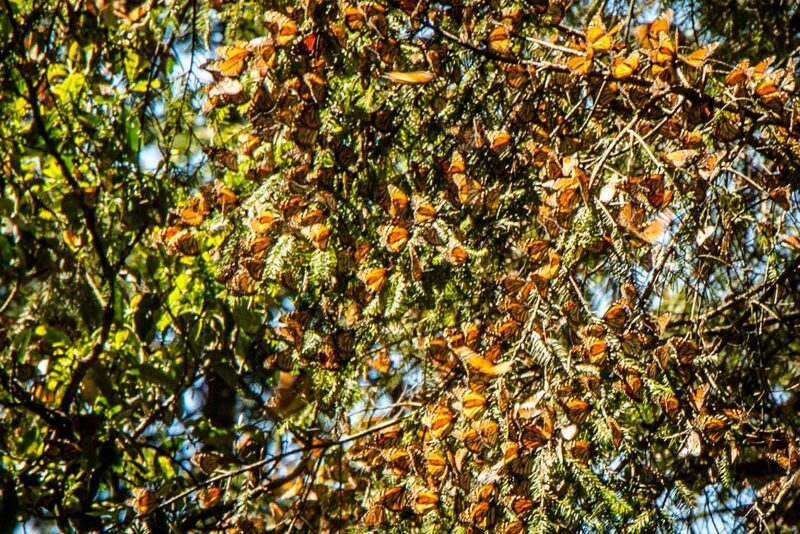 You can read about the spring migration of the monarchs here and more about how monarchs migrate here. 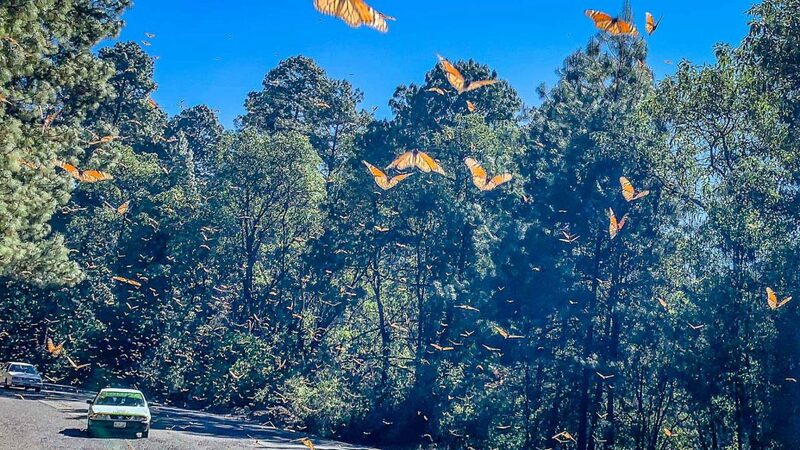 Note, the migration to Mexico is seasonal and the best time to see monarch butterflies in Mexico is November to March. 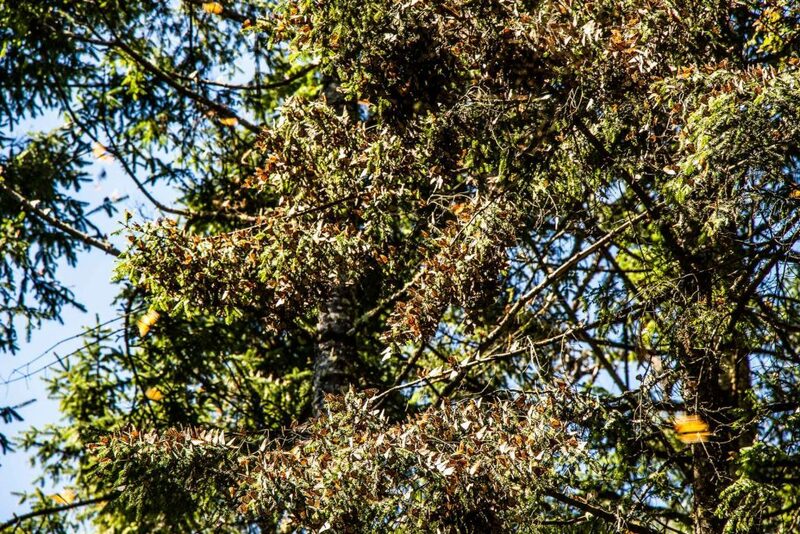 In addition, the butterflies cling together on the sides of the trees when it’s cloudy or cool, which makes it much less interesting. 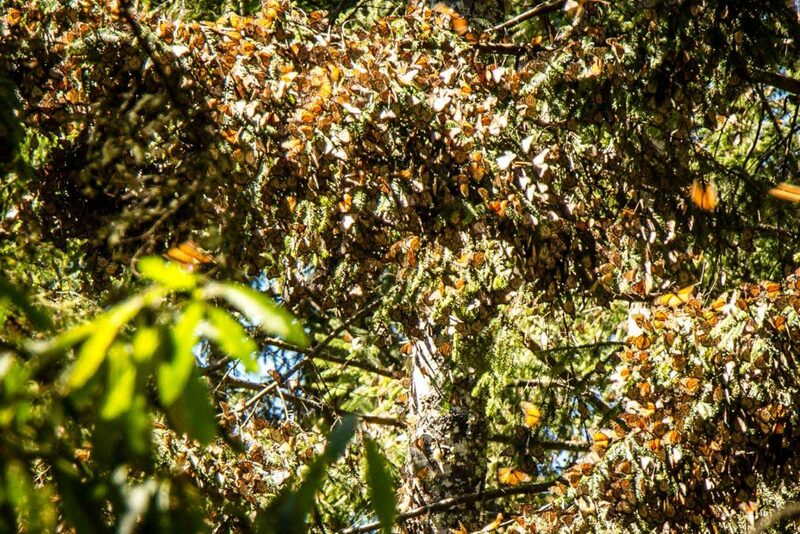 But, when it’s hot and sunny out, like it was for us today (81F / 27C), that’s when the magic happens; the butterflies leave the trees and fly through the forest in such massive numbers, you won’t believe your eyes. Someone needed a little rest on the way back down! There are simple, but good facilities at the bottom. There is bottled water and snacks for sale, as well as a toilet to use. 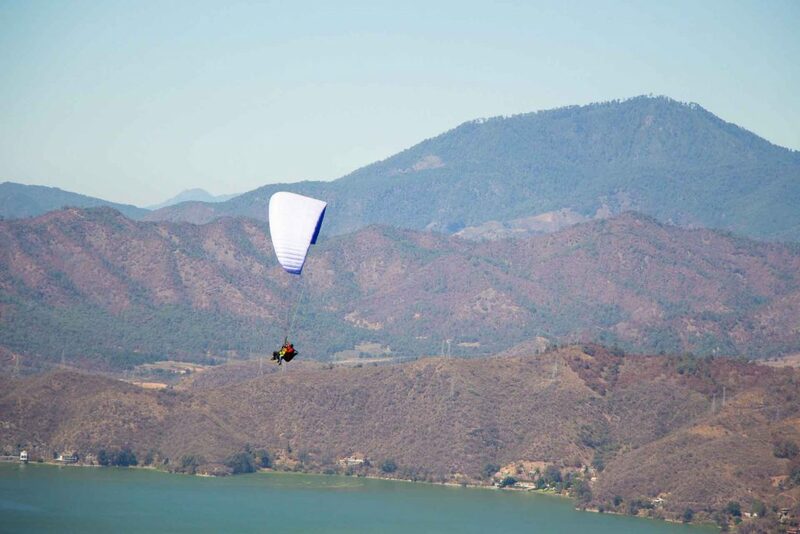 Due to the surrounding hills and abundant natural beauty, Valle de Bravo is a very popular spot for paragliding. 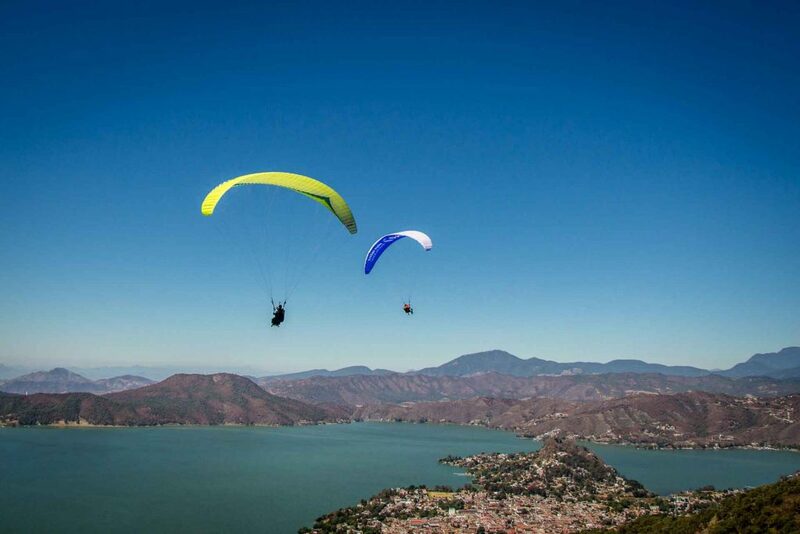 At any given moment, you can look up and see several paragliders floating gracefully in the sky above town. The paragliders take off from a launching pad high up on La Torre mountain south-east of town, and we thought it’d be a fun idea to hike up there for the view! We really enjoyed our 45 minute walk through town to the trailhead. 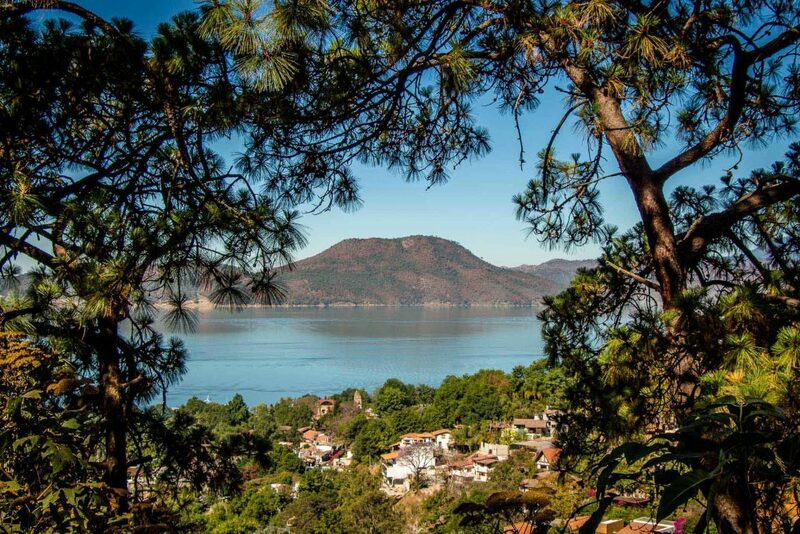 The first part was through a charming non-touristy commercial area, then we transitioned to residential streets along the lake where we got to see first-hand some of the beautiful multi-million dollar homes of the Mexican upper class. Finding the trailhead wasn’t easy. 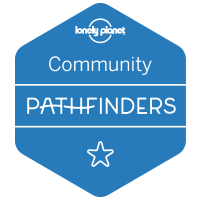 We looked at hiking trails on Terra Maps, our favorite hiking app for finding trails in foreign countries. We could see a hiking trail on it, but it wasn’t clear where the trail began. We then looked at Google Maps satellite shots and came up with our best guess on which street takes us to the trailhead. Our first guess on the trailhead was wrong, but a nearby shopkeeper gave us proper directions. If you are walking or taking a cab, navigate towards this spot. Continue walking uphill past the orange resort until the cobblestone ends. 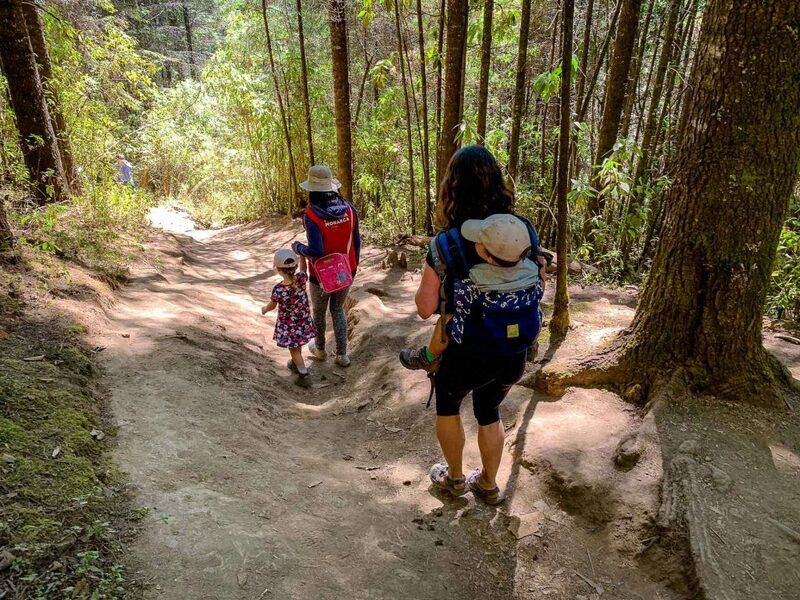 You will then have a choice of three trails – it took us three tries to pick the right trail, but ultimately we got it right… take the middle one. You will encounter a spot along the road with two Private Property signs on either side of the road. They are positioned such that it looks like you cannot pass. At this point, we felt defeated and turned back, but thankfully we met up with a local who was also hiking La Torre. He said the signs did not apply to the hiking trail and invited us to join him on his walk to the summit. He was a very kind man who spoke good English, so we were able to have a nice conversation along the way. The hike itself was amazing. The trail is 2 miles (3km) long and gets a bit steep in spots, but it’s not too bad. We picked up our kids a few times as they were being a bit slow and we didn’t want to hold up our guide. We felt that they’d have been able to hike up it on their own if we hadn’t had this extra time pressure. The hike wound up the mountain through a beautiful pine forest, which wasn’t very thick, so we were treated to amazing vistas of the lake below. We reached the top safe and sound and thanked our new friend profusely. We are so lucky to have bumped into him at that precise moment; we didn’t see another soul on the trail all day. He really saved our whole day! 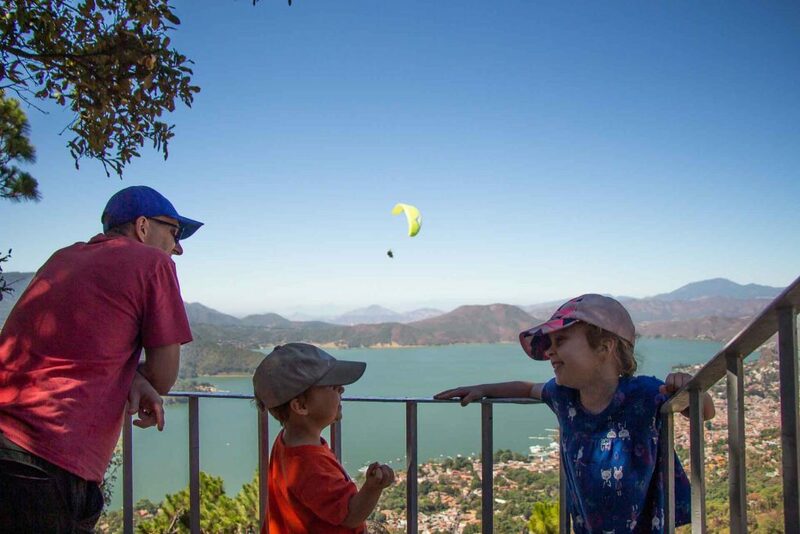 The views from the launching platform are breathtaking, looking down on Valle de Bravo and Lake Avandaro with towering mountains all around. 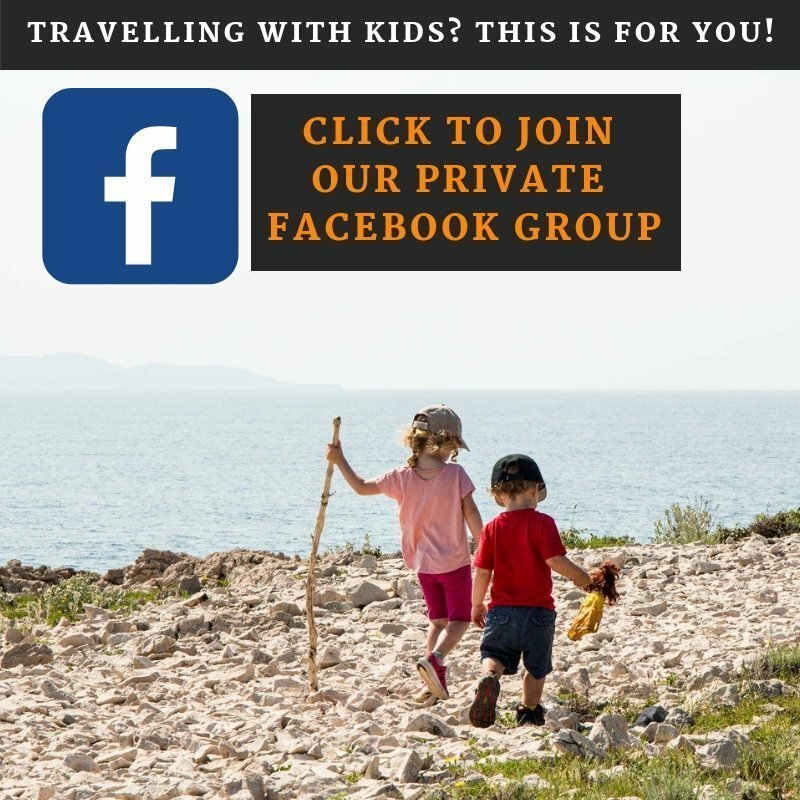 We were very nervous having our little ones on the parasailing launching pad as it had a steep drop-off, but there was a safer viewing area off to the side where we went to eat our lunch. We were lucky to have a group of people up there taking off for their paraglider flights, so we got to watch them take-off. This was a great way to spend a day in nature in such a beautiful location. 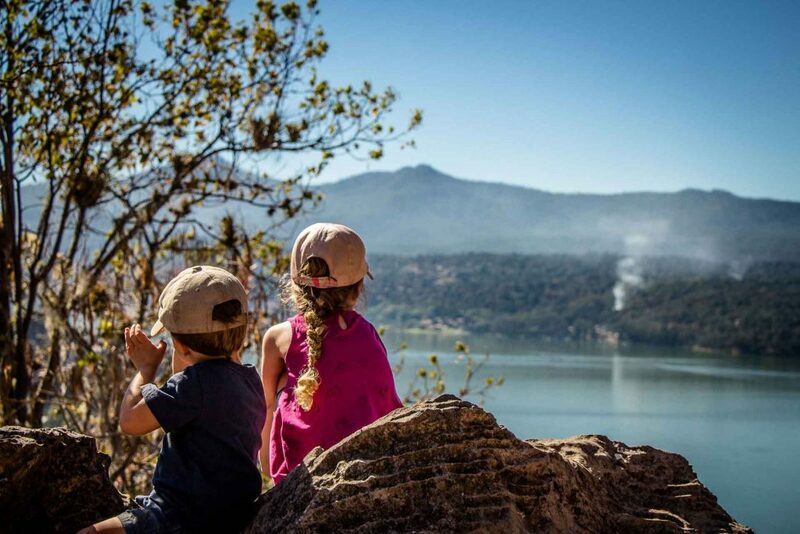 If you enjoy hiking to viewpoints, we’d highly recommend it! 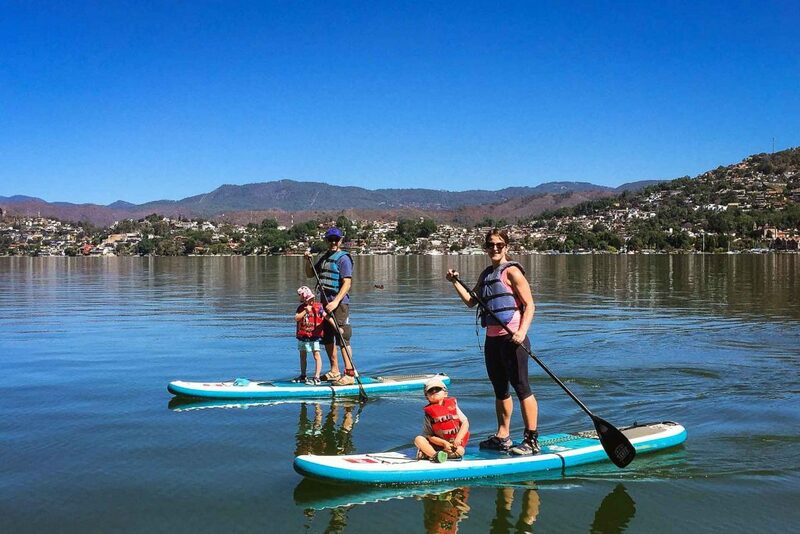 Today we went stand-up paddleboarding on Lake Avandaro. You can rent SUPs from vendors down by the waterfront plaza, but we found a guy offering SUP lake tours on Airbnb Experiences, so we thought we’d give him a try. We met our guide at 10am down at a waterfront park, ironically it’s where the paragliders land. It’s a small patch of grass near the water, but it’s only one of five public access points to the lake – the rest of the land is owned by the wealthy homeowners. Our guide Arturo was great with the kids; he didn’t charge anything for them and he even had two small lifejackets for them. He had no issues with the kids just hanging out on the front of our SUP boards. For 90 minutes our guide took us around the southern part of the lake. 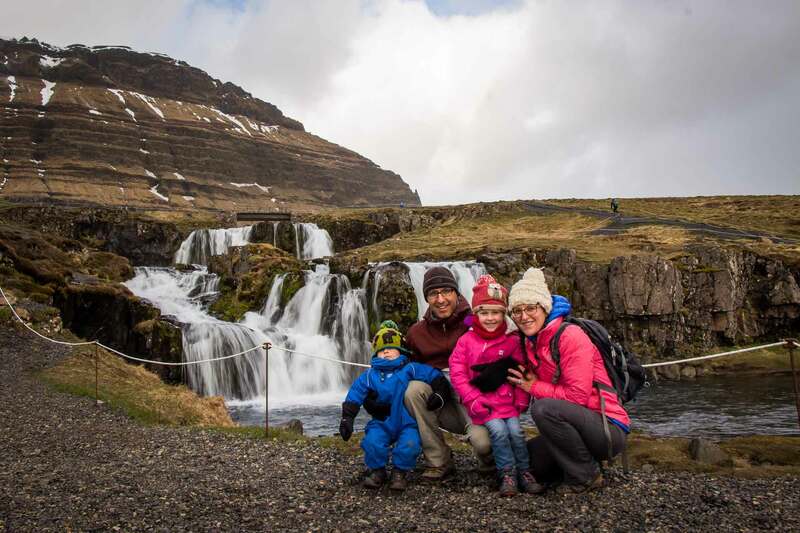 We stopped several times near some scenic waterfalls feeding into the lake. Even the homes around the lake were fun to look as they are multi-million dollar properties with beautifully maintained trees and gardens. The water was so calm and glasslike during our tour. Our guide said that the mornings are always best for SUP as the wind starts to pick up in the afternoons. There was supposed to be a swimming element to the tour, but to be honest, Lake Avandaro had a thin layer of algae on the top, so we elected to skip that part. Our guide said the algae was result of water being diverted from another lake into this one to prop up the levels, which are closely monitored as Lake Avandaro supplies 20% of Mexico City’s drinking water. 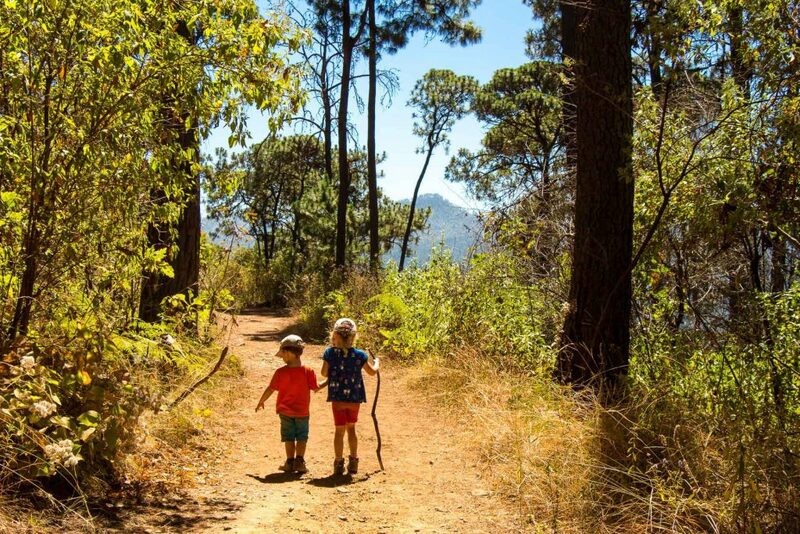 We enjoyed our first hike in Valle de Bravo so much that we wanted to hike to another viewpoint to soak in more of the amazing scenery. 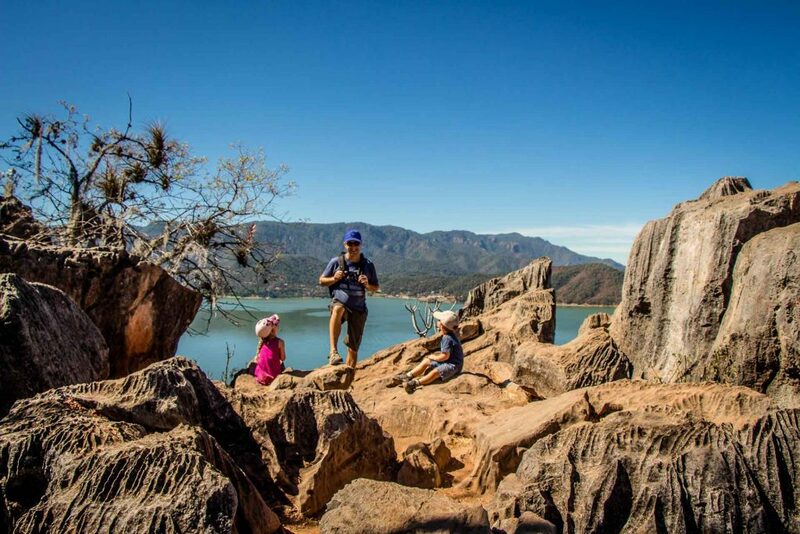 The most popular hike in Valle de Bravo is to Mirador La Peña. As with our previous hike, we decided to walk from our Airbnb to the trailhead. This time we walked through a typical middle-class neighborhood, which was fun to see how the normal people live (vs the ultra-rich along the lakefront). The walk to the trailhead starts to get very steep at this spot, when you start to walk uphill along a quiet residential road. If you are not comfortable with steep inclines, it might make sense to take a cab to the end of this road to where the trailhead begins. The walk along this road was interesting as it’s a neighborhood in transition. There are a few high-end view properties on this road, but they are side-by-side with modest homes. The Mirador La Peña trailhead begins here. 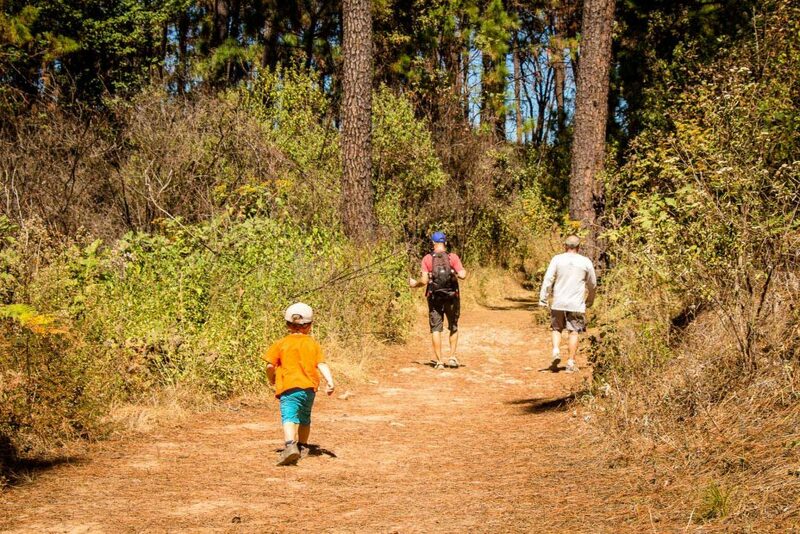 Once you leave the road and begin the hike into the park, the trail becomes super-fun for the kids. 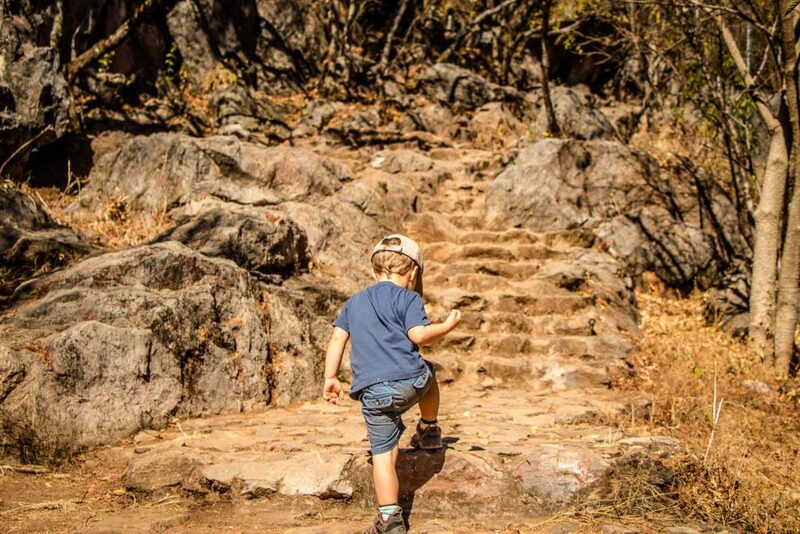 There are small, climbable rocks all along the sides of the pathways which our kids went nuts over. It seemed like they wanted to climb up and over every one of them. We weren’t in a hurry and the kids were having so much fun, that we pretty much let them as long as it was safe. The trail itself is still pretty steep, but it’s not that long of a walk to the summit. Along the way, there are many amazing viewpoints of the lake below, each better than the last. Near the top the kids discovered a small passageway into a small “cave”, which they thought was the greatest thing ever. 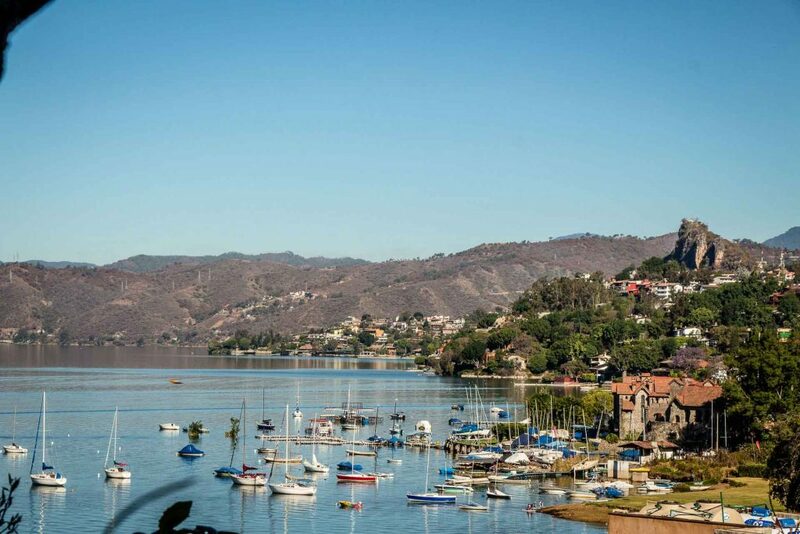 Once at the top, the views of the lake and surrounding area are breathtaking. 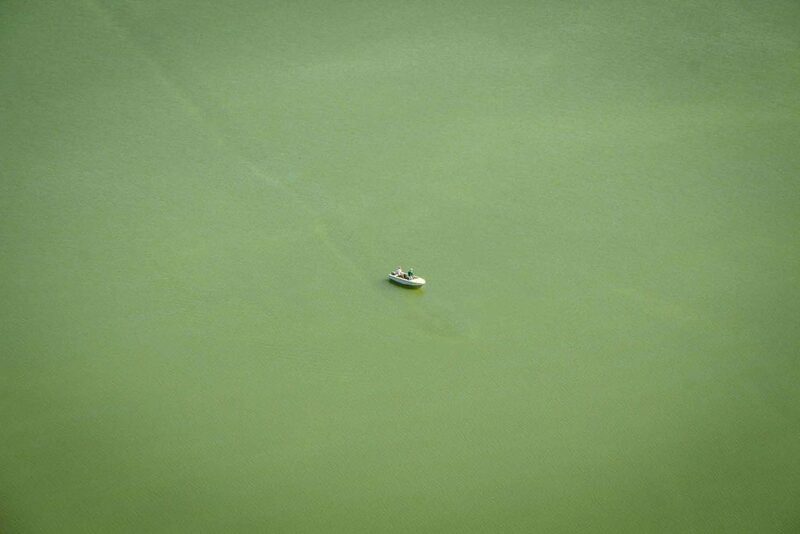 Even the unfortunate layer of algae was a beautiful, glowing bright green in the bright Mexican sun. 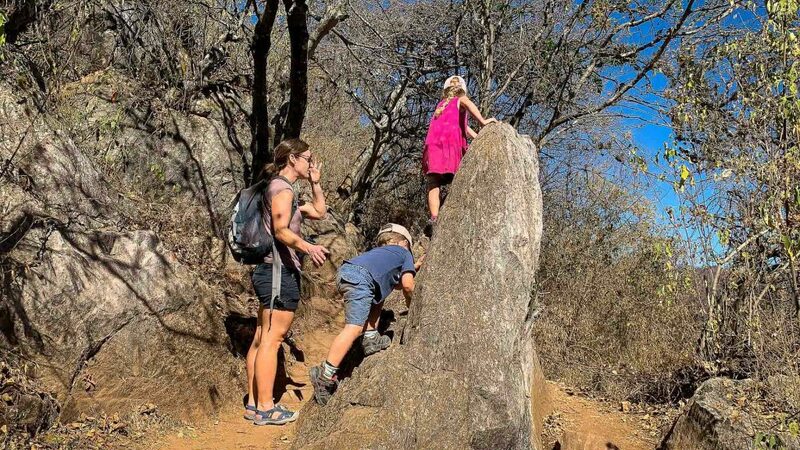 Be careful with your kids as there are no safety rails up top and some of the drop-offs are pretty scary. There’s plenty of room up top though for everyone to enjoy the views away from the edges. The produce market: In recent years we have noticed a big improvement in the quality of the fruit we get in Canada over the winter, and much of it comes from Mexico. 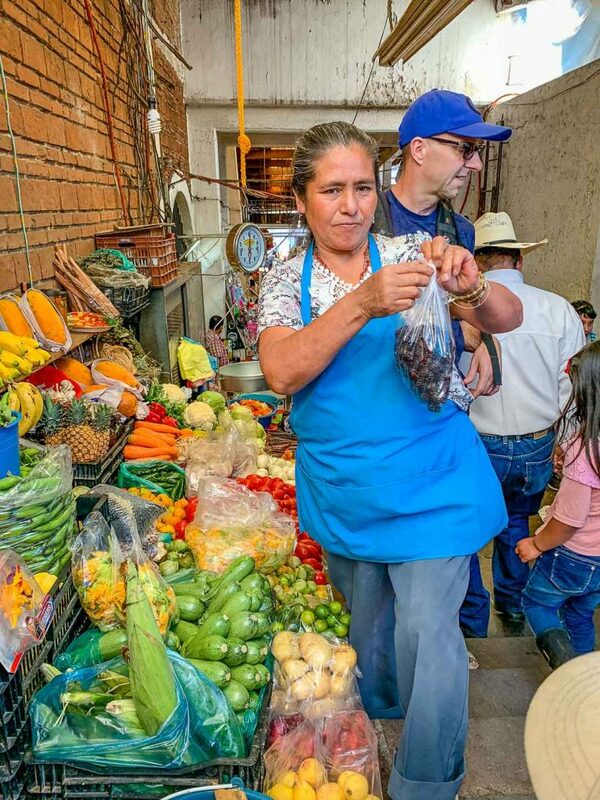 After a week of hardly seeing any produce in Mexico City, we were overjoyed to see the large quantities of fruits and veggies on display at this market. We bought so many avocados, blackberries, guava fruit, mangoes, cucumbers, tomatoes, carrots etc. at this market. The produce was great quality and very reasonably priced. 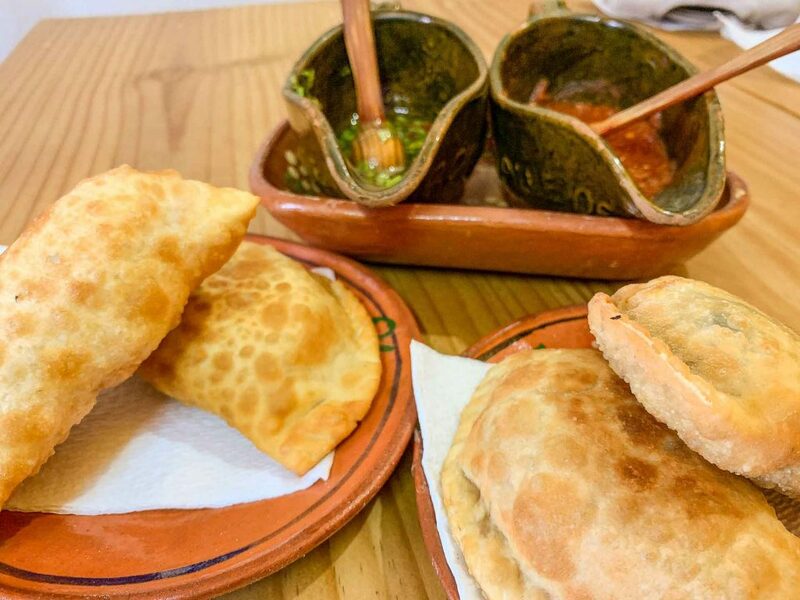 Empanaderia: We found this little hole-in-the-wall on the way back from stand-up paddleboarding and it was our favorite restaurant in Valle de Bravo. It’s a few blocks outside the tourist zone and is a real treasure. We tried a wide variety of the sweet and savory empanadas on offer and loved each one. Even the kids devoured theirs! 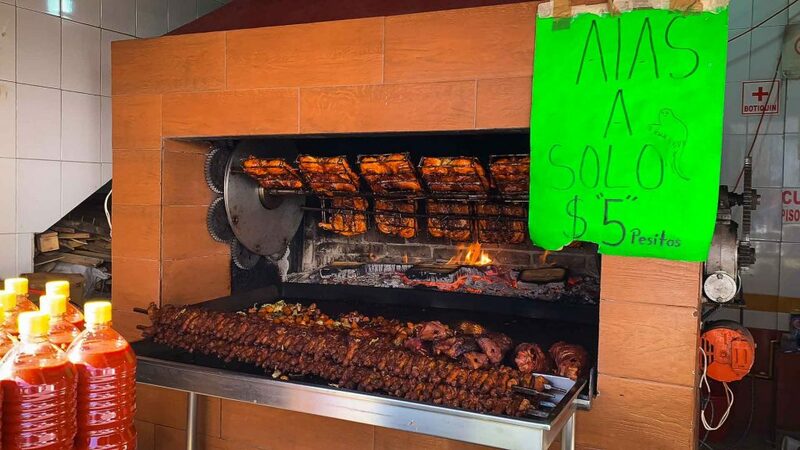 Mi Lupita: There are many take-away vendors in town who have large barbeques cooking mouth-watering rotisserie chickens. Mi Lupita looked especially good so we gave them a try. The chicken was so juicy and flavorful (not spicy at all) that we came back a second time. This time we got chicken and bbq pork ribs, which were so amazing. Taco Alley: There’s an alleyway in the pedestrian only part of town which has back-to-back taco stands the whole way. There must be 6-7 different taco stands, each with their stools filled with hungry visitors. We ordered take-away tacos a few times from different stands. We especially enjoyed the Tacos al Pastor and Arrachera Tacos. Ice cream: This place isn’t in Google Maps, but the ice cream at this parlor opposite the church in the main town square was amazing! 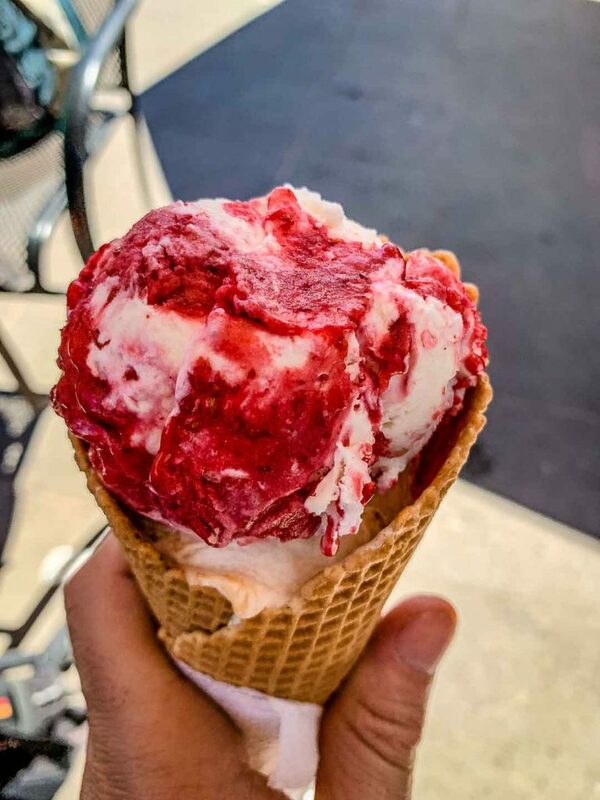 We highly recommend the fresa con queso, which had fresh strawberries and what appeared to be chunks of cream cheese. Yum! 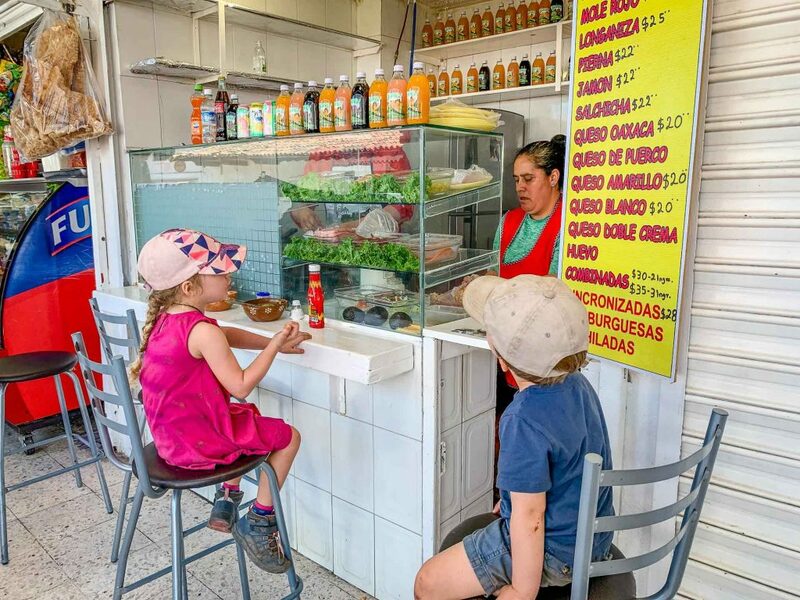 If you want a simple lunch, you can’t go wrong with stopping at a small tortas stand. They make one amazing sandwich! 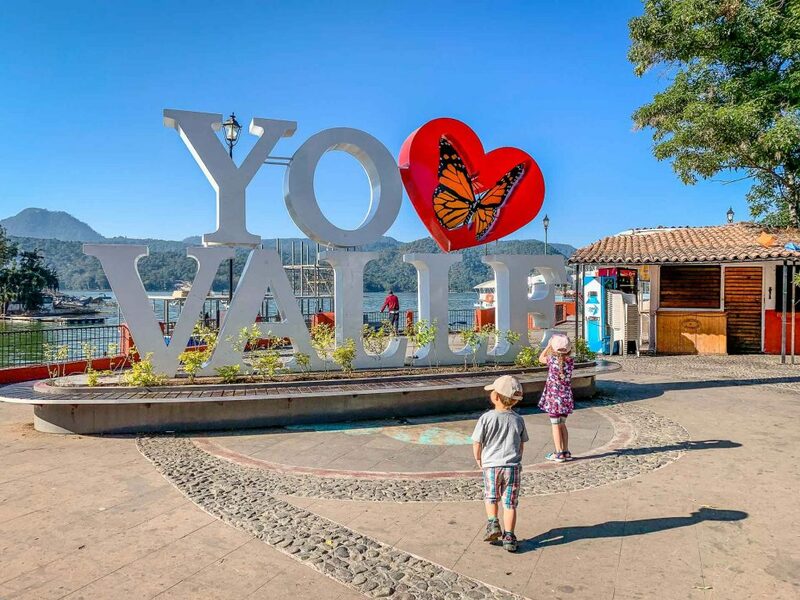 The main tourist area of Valle de Bravo is pretty small. If you’d like to stay in the middle of the action, try to stay within 1-2 blocks of the main town square. If you have a car or don’t mind a hilly walk to and from town, there are also many great places with amazing views in the hills around town. 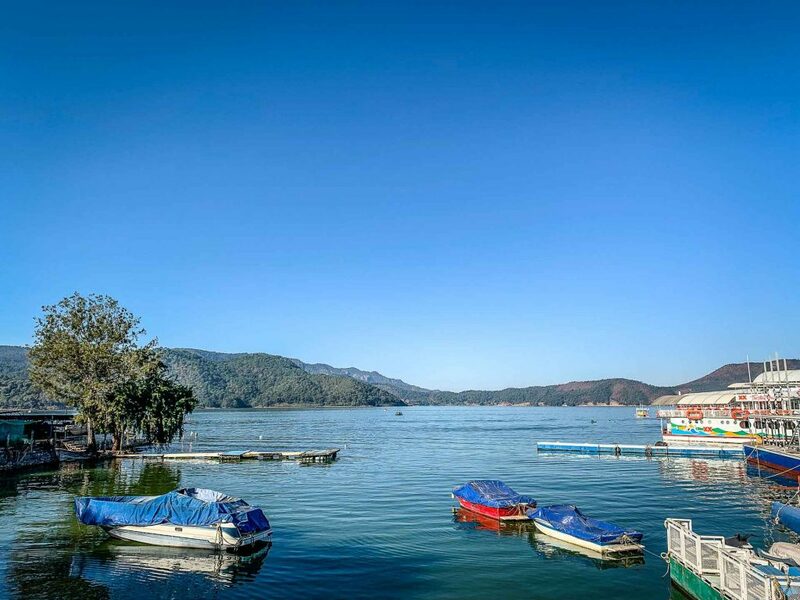 There are no major hotel chains in Valle de Bravo, but you can still find a good selection of Valle de Bravo hotels in all price ranges. There is also a good selection of vacation rentals on Airbnb and VRBO. If you haven’t signed up for Airbnb yet, sign up with our link and get a $35USD credit towards your first stay. 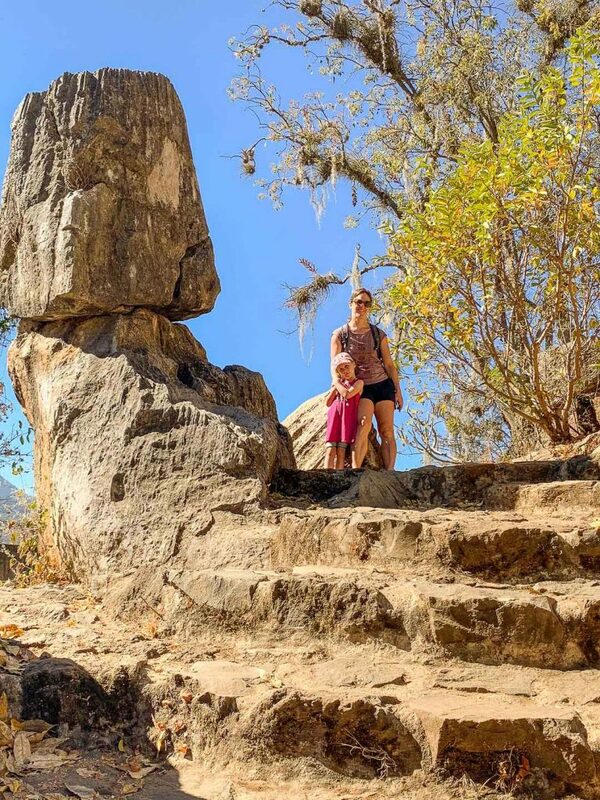 We had a great time in Valle de Bravo and couldn’t be happier that we added it to our Mexico itinerary! 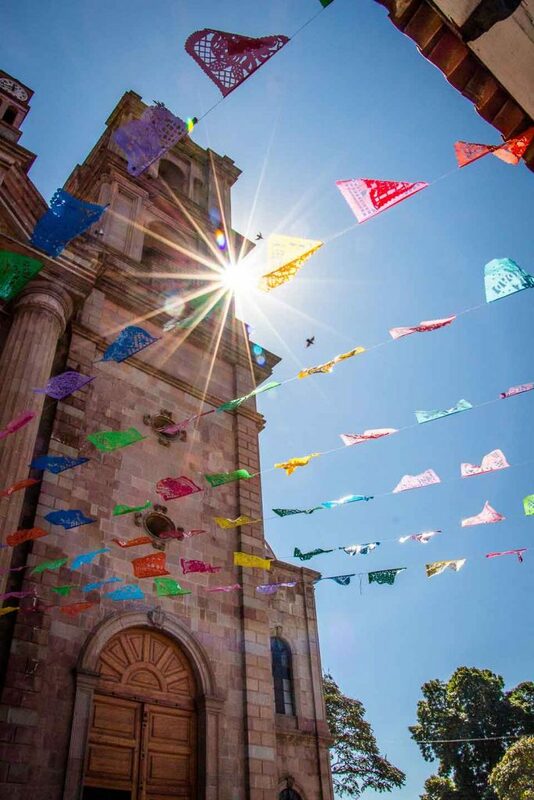 It’s laid-back atmosphere and pedestrian only streets seemed a million miles away from the craziness of Mexico City. 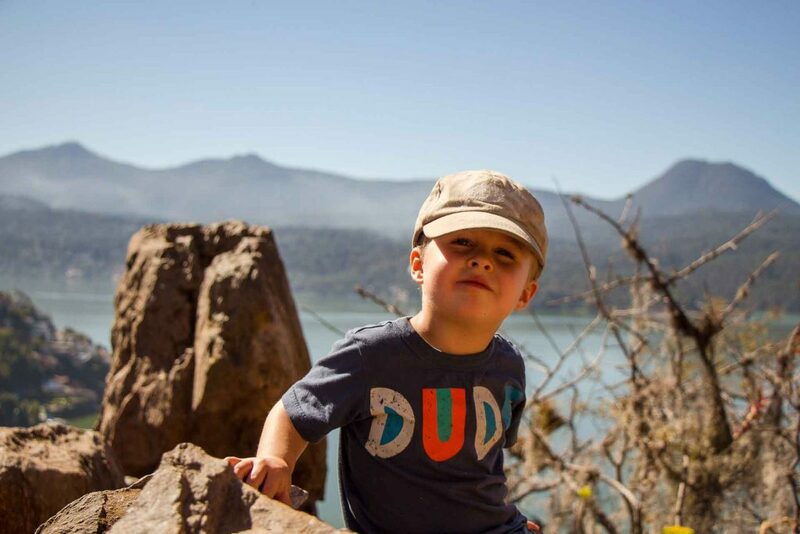 We love outdoor adventures and Valle de Bravo delivered big time. The atmosphere in this town is just so happy, we really enjoyed every minute of our stay. One final thought… I think one of the reasons we liked this place so much is that we were here on holiday with Mexican people, instead of around other Mexicans who are just working at the resort.